SearchReSearch: Wednesday search challenge (7/11/12): Where can I get that book? Wednesday search challenge (7/11/12): Where can I get that book? In my recent travels, I took a picture of this window, and was just standing there in the nave admiring it. While standing I started chatting with someone there who mentioned that the designer of the window had written an important book on stained glass design. Sounds interesting--I'd like to read that book. I went to your Google+ stream. I looked back a few weeks and noticed that you went to the La Sagrada Familia in Barcelona. Then I did a search for La Sagrada Familia, Barcelona stained glass in search > then I went and found your image as the first image. I found the artist was Antoni Gaudí. I did a search on Amazon for Antoni Gaudí books and came up with http://www.amazon.com/Antoni-Gaudi-1852-1926-Bruxelles-octobre-1er/dp/8450520061/ref=sr_tc_2_3?ie=UTF8&qid=1342010484&sr=1-2-ent which you can buy one copy for $51.-1 but it is used. There are 32 book either written by him or about him listed in Amazon. Google books also lists 73,500 results for him in books as well. I would go to Amazon myself. It is limited stock so I would still call. Image search in Google: Visually similar. This image is labelled "Sagrada Familie '11"
Searched for this term brought Wikipedia's entry, which led to Joan Vila-Grau's Els vitrallers de la Barcelona modernista on sale in Minneapolis at Alibris. This took about 5 minutes, I think. One match. Follow link, don't actually see an image on the page. Ah. Translating from German, I see I have to be registered. OK, what the hell. Fortunately I have a throwaway email address and lastpass makes it easy to do a throwaway password. 2. Oh, yay, the pic on the page (now that I can see it) is captioned "Sagrada Familia" -- one of my favorite architects :). 3. google image search for [ "sagrada familia" "stained glass" ] to confirm that it really is from there. It clearly is. Follow some links from that page to find out who designed the stained glass. 4. Looks clear from http://www.sagradafamilia.cat/sf-eng/docs_instit/simbologia_b5.php that it's Joan Vila-Grau. 5. Vila-Grau doesn't seem to have a WP page, so I google his name. OK, that gets me to a WP page, under Joan Vila i Grau. Clearly the same guy. Translating the page shows me only one book, /The glassmakers of modernist Barcelona/, which doesn't really sound like the right one. Fita: Vitralls, 1956-1987/. No info on the book page that's helpful. Google translate from Catalan tells me that means /Milestone: Stained Glass, 1956-1987/. 11:02 lost 5 minutes to a necessary distraction. 7. I'm guessing the book you want is the latter, although it's not clear. No idea how best to find a local copy of a book. Fiddle around with Google searches like [ "nearby copy" book ] and [ "local copy" book ]. Stumble (via http://new.wellesley.edu/lts/gettingstarted/alumresources) on the fact that Google Books will find a local library copy for me. Try that. Oof -- nothing closer than the East Coast. Check the other book just in case. That one's much easier; UC Berkeley has a copy. 8. Now I have a sneaking suspicion that you meant the book that's at UCB. I'm gonna punt on the other one, and say that you can get a copy via interlibrary loan if that's what you really need. ondemandbooks.com doesn't offer it, and you probably wouldn't want a print-on-demand copy of a book like this anyway. 11:16. Elapsed time (not counting 5 minutes away from the task): 28 minutes. It took me about 20 minutes of searching. First step was a google "search by image" for your photograph. That linked me to a blog post written in Japanese from a person who happened to visit the same church. The google translation was mostly gibberish, but I at least discovered that the church in question is in Barcelona. I followed that up with "Barcelona Church Stained Glass" to find out the name of the church - Sagrada Familia. "Sagrada Familia Stained Glass Designer" led me to the designer's name, and a search for "Joan Vila-Grau book" led me to an Amazon page listing the book as unavailable. I then searched "libraries near Mountain View CA" and discovered the Mountain View public library, whose website suggested I search worldcat. I searched for the book there, inserted my location as Mountain View CA, and voila! UC Berkeley library. If you are a member of the general public, you'll need to get a UC library privilege card to read it first though! Otherwise, you'll have to travel 1800 miles to the Art Institute of Chicago. Joan Vila-Grau was the designer of the stained-glass windows in La Sagrada Familia. Vila-Grau is listed as having written and cowritten a number of books, but I believe the book you're looking for is one of: "Fita: vitralls, 1956-1987" by Joan Vila-Grau, Domenec Fita, and Xavier Carbo. [la sagrada familia stained glass] brought up a number of pages describing the installation, and I skimmed some of the top ten looking for the words "artist" and "designer". I got wrong-footed by a vaguely-labeled photo credit, but eventually hit on the page I linked above and an article in the Catalan News Agency that implied that Toni Vila-Grau had done it. [Toni Vila-Grau stained glass] got the suggestion "Joan Vila-Grau", though. I then did a site search of amazon.com for Vila-Grau and came up with two books: the one above, and one that looks like a retrospective of her work. Google Translate gave "vitralls" as "stained glass", so I went with the first one. I found the book in WorldCat via books.google.com, typed in the Mountain View ZIP code, and got Library of Congress as the closest result. Clicking on Joan Vila-Grau's name in WorldCat gave me a list which included the other title I listed above, which also seemed on-target. Assuming the zip code for Mountain View CA is 94040. You should be able to find a copy of the book "Els vitrallers de la Barcelona modernista" by Joan Vila-Grau at University of California, Berkeley which is about 35 miles away. Started with an image search of the window to find the church LA SAGRADA FAMILIA in Barcelona. Then cound the book and the library through worldcat.org. Search took me about 15 minutes. I found the artist´s name: Antoni Gaudi. I search your photo on the google search...drag your photo to the search window, for looking on similar photos...then google showed to me some examples, similar photos, and I click on one in particular, that shows me the cathedral with the stained glass made by Antoni Gaudi....Also in the same google search page, they showed a link to some books, and then I find this one in AMAZON, with free shipping: Antoni Gaudi the Criterion collection.....cool! I started my search at 10:50 am and found the book at 11:42 am. I then changed my location to Mountain View, CA and said Find Book and worldcat came up. I searched for zip code for Mountain View and entered it. Alas! The book is at The University of California, Santa Barbara, still 241 miles away from you. I believe the windows were designed by Joan Vila-Grau (that took me about fifteen minutes to find)for the Sagrada Familia by Gaudi. Vila-Grau has written a book called The Stained Glass of Catalonia Today. That took me another fifteen mintues. But I still cannot figure out where you can read this book. I have tried libraries in and near Mountain View and San Francisco. I have tried to find Basque centers and/or museums (the big one is in Boise, Idaho . . . whoda thunk? ), etc. NOTHING! I searched the image URL through Google Images, then found another photo of the same window that listed the place where it was taken. I made a 10-minute detour searching someone that I thought it was that it ended up not being... but then I was back on track and used worldcat.org to advance search by author and keyword, then find in a library near your zip code. If you're fluent in Spanish, you can check out Els vitralls medievals de l'Església de Santa Maria del Mar, a Barcelona at Stanford. Total time: 15 minutes. Okay....I think I've found what you're looking for. In doing searches for "Goudy" and "stained glass" Google wondered whether I had meant "Gaudi." Ah-hah. I did a Google Book search for Gaudi, and discovered a book of his writings, called "Scritti"; "writings" in Italian. Doing a WorldCat search of the book, it appears that two libraries worldwide own the book: one in Barcelona, and the other at the University of California, Berkeley. It looks like it would be a lovely drive from Mountain View to Berkeley. Enjoy! I believe the artist is Joan Vila-Grau and the book that you are referring to is 'Els vitrallers de la Barcelona modernista'. Good luck finding a copy nearby CA though. The closest one I found listed is in MN! I started my search by using google image, narrowed down the location of the window to Sagrada Familia and then searched for stained glass--found Joan Vila-Grau mentioned as being the designer of the windows. I then quickly searched Joan Vila-Grau's website and found 'Els vitrallers de la Barcelona modernista' published in 1980. I found the book for sale used through Amazon & Alibris. I am not sure to be correct, as it is a hard challenge, but that is as far as I got. I first used the photo to look for similar ones on Google Images: I found a hit for The Sagrada Familia in Barcelona. I did a new search with terms [stained glasses sagrada familia] in Google Images and found very similar ones, and found out with [sagrada familia stained glass craftsman] that Joan Vila-Grau made them in the late 90s. The Portuguese page on Wikipedia for Joan Vila-Grau mentions the book "Los vidrieros de la Barcelona modernista", which I also found on Amazon. Also, as I am French, I did some searches in french similar to [joan vila-grau book], as I suspected that because he is spanish, I might have better results in French given the proximity... and I was quickly led to Corpus Vitrearum (which also mentions stained glasses of Barcelona by Vila-Grau), which seems to be a sort of encyclopedia regarding stained glasses. This took me about 45-60 minutes... If I am correct! Step 1 - find out the image. Straight up google image url search to find similar images - there is one, in google cached view of a german horticulture message board. If I was smarter I would've been done right there (the photobucket link doesn't come up on the google search, but here it is: http://i1195.photobucket.com/albums/aa399/deutscheaishe1/99.jpg). So I actually re-ran the image url search using the new image link, and gothttp://www.styledbywhit.com/2012/03/barcelona-and-little-london.html. This told me the name of the cathedral, so "stained glass" "sacred family cathedral" designed gave me enough to know the name, finally - Joan Vila-Grau. At this point I went straight to the Moutain View Public Library catalog and did an author search. I also did a Google Maps search for libraries near Mountain View. I'm on the other side of the country and don't really have a "sense" of the geography out there, so I gave up on that pretty quick. I also spent some time here looking for art museums, art libraries, private collections with public viewing events... anyway, no luck. Then I went to find the book title - took several false starts (the only wikipedia page for this person is under a different transliteration of the last name and is in Spanish, but I got the title there): "Els vitrallers de la Barcelona modernista"
It took me a while (and some false starts) looking at used books, found three copies in the US through Abebooks and Amazon. Finally happened to see a "books" search for Google and got on that - clicked to the book page, saw "find in a library" and I'm whisked away to globalcat. First thing that came up on that was in puerto rico, and I could figure how to navigate globalcat at first, so I re-ran the title search directly on that site and now I had the Berkeley result. Done. Learned some stuff this time around, interesting challenge. The book can be found at the stanford university libraries. Stanford, CA 94305 United States, 11km away. Used Google search by image to locate the name of the church, "Sagrada Familia" in Barcelona. 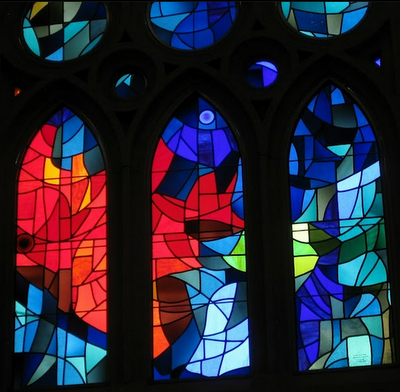 A search for [Sagrada Familia stained glass] returned several sites highlighting the art and windows in the church, and identifying Joan Vila Grau as the designer. Another search for [Joan Vila Grau] reveals the artist's website as the top result, where there is a list of all of Joan Vila Grau's books, articles, and publications (http://joanvilagrau.net/). There appear to be several books written by the artist, the oldest of which is "Els Vitrallers de la Barcelona Modernista." Google shopping results did not help any, but there seem to be a few results via Amazon.com. Los vidrieros de la Barcelona modernista, and there is a copy at the University of California-Berkeley. This was surprisingly easy, actually. A trek through Google image search brought up a similar image. The page itself was defunct, but Google's cache showed the image, which included the phrase "Sagrada Familia" in the bottom right corner. A Google image search for "Sagrada familia" "stained glass" confirmed that these were indeed stained-glass windows at that cathedral. A regular Google search for "Sagrada familia" "stained glass" revealed that Joan Vila-Grau was the designer. Then I went to WorldCat, plugged in the book title, and asked it to find a copy at the location nearest Mountain View. It recommended that I go to the University of California-Berkeley. I did a Google Image "search by image" search of the picture you provided. It came up with a couple results but I couldn't determine very much from that. So I did another Google Image "search by image" search of one of those pictures and then determined that the stained glass was located in the Sagrada Familia in Barcelona. From there, I searched on Google for "stained glass sagrada familia" and determined that the glass was designed by Joan Vila-Grau. Searching Amazon, I found the name of the book: "Pilar Muños." From that, I went to Worldcat.org and searched for the book and it told me that the book was 307 miles away at the University of California, Los Angeles. So...He is the author of several books, some of which can be found at the University of California, Berkley Library. I found by searching google images for [stained glass book artist]. I selected "black" as the color. I then found your picture and click "similar". From there I found another image that was similar and on that website ( http://www.awanderingsole.com/page/20) I was able to find the name of the cathedral. I then searched [la sagrada familia stained glass]. and found the designer of the stained glass window to be Joan Vila-Grau. I then searched [Joan Vila-Grau publications] and selected timeline. On the timeline I selected "publications by Joan Vila-Grau" and it took me to WorldCat and used the search [au:Vila-Grau, Joan]. I selected "book" as the format and then "art and architecture" as the topic. I selected the first book and put in the zip code for Mountain View, Ca. The title of this book was "Els vitrallers de la Barcelona modernista"
Image saved so I can drag and drop to Google image search. Add [stained glass window] to search to find image of window in question. Identified as windows in Sagrada Familia cathedral. Cathedral website notes that the windows in question are in the apse of the cathedral and were designed by Vila-Grau and made by J.M.Bonet's stained glass company. Bonet's website confirms it. I have to admit I got shakier and less sure at this point. I mean...I did a Worldcat search for books written by Vila-Grau but it returned more titles that I expected. The title that seemed the most general and that might be about current stained glass design rather than art of a specific period or artist seemed like Els vitrallers de la Barcelona modernista. And the closest copy of that title to Mountain View, CA is at the University of California, Berkley in the Northern Regional Library Facility. Hard time saying how long it took since I did a little here and there as I had a moment. A Google Image search turned up a single result pointing to a German Forum, but the image was available with in larger size. The text in the middle of the image "Lieber Maddin, alles Gute Zum Gebertstag" turned out to be not of any use. But, tucked away in the bottom right corner was " Sagrada Familia '11"
For books in local libraries, WorldCat.org is a good resource. 94035 zip code reveals the nearest copy (in the original Catalan) at the UC Berkley library, 34 miles away. then i headed to the "website for this image" option and found a blog about a stained glass designer named "Lawrence Lee" and i went through the blog little and found something related to the thing what um looking for. Take photo of picture, use Goggles to identify, name, website. Use site to locate artist. Next, having artists's name use Google Books to see if he is the author. Finally, use WorldCat to locate book in library nearest to Mountain View. to be fair you knew where this particular piece of stained glass was located so you could have searched for who designed the glass for that building, which would be a start. The closest copy of "Las vidrieras modernistas Catalanas," which was co-authored by Joan Vila-Grau, is located approximately 241 miles away in the Davidson Library at the University of California, Santa Barbara, Santa Barbara, CA 93106 United States. I did repeated "search by image URL" searches starting with your original image until I found http://goo.gl/N06AR which both shows a wider angle of the stained glass and places it inside La Sagrada Familia in Barcelona. [ Sagrada Familia stained glass ] led to http://goo.gl/G0cgA which identifies the designer as Joan Vila-Grau. [ stained glass book by Joan Vila Grau ] led to a bibliography of stained glass writings at http://goo.gl/xBXLT which listed "Las Vidrieras Mondernistas Catalanas" as having been written by Grau and Rodon. [ locate book "Las Vidrieras Modernistas Catalanas" ] led to the Google Books page for this work at http://goo.gl/pruzm. The "All sellers" link strongly suggested that copies of this book were not widely available for sale. The "Find in a library" link led to a worldcat.org page at http://goo.gl/fzpTD and seemed more promising. When I put in "Mountain View,CA" as the location, it came back with the Davidson Library at UCSB. So, the first thing I did do an image search by your image. One required a log in to a message board, so no dice there, but the other was a Japanese site that Google easily translated for me. It was there that I discovered that the windows were in a church designed by Gaudy, which I assumed was the Basilica de la Sagrada Familia in Barcelona. A quick search of [Sagrada Familia stained glass] not only confirmed my suspicions but also gave me the designer: Joan Vila Grau. So there is the name. Now, for the book and finding the closest copy to you, I went to good ol' worldcat.org (sometimes being a librarian is good) and typed in his name. Looking through the results, I think the book you are looking for is "Church of the Sagrada Família : the stained-glass windows by Joan Vila-Grau". According to WorldCat, the closest copy is in the Biblioteca Nacional de Espana in Madrid. However, the Mountain View Public Library should be able to get you a copy via inter library loan. Maybe. Not sure if this is correct or not, but either way, it took me about 15 minutes. This is indeed a hard challenge, took me 30 minutes, but I'm new to trying searches like this. I first searched the image on Google image, which led me to a japanese blog. From there I copied another image above the one that looked like yours. It told me that it was from the "Sagrada Família". I looked it up on Wikipedia, in spanish with Google translate. Searched for glass and found it was designed by Joan Vila i Grau. Looked up "Joan Vila i Grau book" in google and the first link brought me to a list of book, including "Els vitrallers de la Barcelona modernista". Being french, I recognized that this was about glasses by the title. Then a quick lookup on Google led me to Worldcat, a new site I discovered, which shows you libraries near you. I entered the location "Mountain View, CA" and it now tells me that the book is available at the University of California, Berkeley. My first language is french, and I really am new to powersearching like this, so I guess somewhere along the road I could've been able to skip a few steps to get to my answer! Final answer : "Els vitrallers de la Barcelona modernista" by Joan Vila-Grau, available at the University of California, Berkeley. It is a cathedral in Barcelona. Check on the cathedral's website site and found Joan Vila-Grau designed the stained glass windows. Search Worldcat.org for that book in libraries near Mountain View, CA. UC-Berkeley - 34 miles away - has a copy if you want to read it. They were designed by Joan Vila-Grau. He wrote a few books, but the one you're most likely interested in is "Las Vidrieras Modernistas Catalanas." You can get it at the University of California, Santa Barbara Davidson Library, which is 241 miles from Mountain View, CA. I did the standard reverse image search on the picture and found an image of the same glass on a Japanese blog. Then I just grabbed THAT image and did another reverse image search. From that search I was able to locate a page talking about the Sagrada Familia church. Quick trip to google and I found that the glass in the church was done by Joan Vila-Grau. Finding what he wrote took a while, but I eventually found a great site that showed an interview with him (http://vidimus.org/issues/issue-40/features/). At the bottom there was a "Further Reading" section with his books. I took the title and started searching. Eventually found WorldCat.org where I was able to locate the book and find the closest libraries that have it. P.S. It took me about 30 minutes. I think I got it... The stained glass is from the church "La Sagrada Familia" in Barcelona, Spain. This I found out doing a query based on the given image. Next I did a query to find the artist who made the stained glass, using the terms "sagrada familia stained glass". The first result had the artist's name: Joan Vila-Grau. Another search for "Joan Vila-Grau books" gave me what I hope is the book you were looking for: Vidrieras Modernistas Catalanas by both Joan Vila-Grau and Francesc Rodon. It took around 20min to find out. The artist is Joan Vila-Grau. Would the book be "Ils vitrallers de la Barcelona modernista"? There is a copy at UC Berkeley Library. The call number is f NK5362.B3 V44 1982 and according to the library's online catalog it is on the shelf. Took about 20 minutes - most of that time spent trying to determine which work fit the bill. Spent more time trying to figure out why Google Books was linking to an inferior record! Then choose english or castellano if you speak it, and click on publications, there's several after that I got tired I think I spent about 15 minutes figuring it out. I gave up and had to look at the comments and I was on the right path, but I was using Tineye instead of google image and came up with no results. I didn't realize Google had that feature. I followed the exact path that James van Mill took. The search took me about 20 minutes. I came back here, afraid to post my stumbling but was really happy to see that someone else used the same strategy. Google Search for "Stained Glass Design Sagrada Familia" Led me to a Barcelona Design Festival listing for a Joan Vila-Grau exhibit for Sagrasa Familia. John Ruskin, an art critic, wrote two books that were highly influential in Art Philosophy. In The Seven Lamps of Architecture and The Stones of Venice, he discussed the moral, social and religious implications of buildings, emphasizing the desirability of an ethical approach to the practice of the arts. His thinking influenced the Pre-Raphaelites, whose artistic style Ruskin defended against criticism. Went to Publications - a number of books listed,all in Spanish even on English site so figured probably not translated in English. Some in MN, GA and elsewhere, limited availability but can purchase. Checked Worldcat.org for libraries - lots of options. But there are 4 titles in English. i uploaded the picture and i found a spanish website that contains the pic so i clicked on the pic and i saw the sagrada familia 11' i searched sagrada la familia i got the church website and wikipedia on wikipedia i found Gaudi designer i searched Gaudi designer i found that he is an architect of Barcelona and i found his website too! but it's out of stock so i changed direction to find that book on another website..
Found it on Google Books but with copyright so you can't read it! Your CHALLENGE IS SO EASY! Thank You Mr Daniel..
Blogger mentions Barcelona and "The cathedral pictures were from the Sagrata Familia"
Unfortunately you will not be able to do more then browse the pictures as the text is only in Catalan which I am assuming you cannot read although Google Translate will help if you see something interesting. Lots of people have posted about how they found it as far as I can tell only two people got the right book. Unlike all these people though To find were the window was located. I went to google images and searched "Famous stained glass windows" and I scrolled down looking for two things: the window(obviously), and structural and artistis similarities. scollong down the page I found an image labeled "Fiery Staind glass windows" and that picture brought me to zazzle.com there I found in the comments them talking about Sagrada Familia ... another google search brought me to http://www.sagradafamilia.cat/sf-eng/docs_serveis/informacio.php I then had to make sure the window in question was indeed at this church. I used the virtual visit option and found the window in question and found that the window was designed by Joan Vila-Grau who ( I found through another google search) wrote the book Las vidrieras modernistas Catalanas. The rest is covered by the others. 30 min tops. Publisher: [Barcelona] Polígrafa D.L. 1983. The designer of the window is Antoni Gaudi and the book that he wrote was Casa Batlló, Barcelona, Spain, 1905-07 : Casa Mila, Barcelona, Spain, 1905-10 / Antonio Gaudi. It can be found at San Jose Library, king folio 8th floor. (150 E. San Fernando St. , San Jose CA 95112 (408) 808-2000). To find my answer, I copied the URL of the picture and pasted it in Google search. I then clicked on the link to similar images and found out that the image was from Sagrada Familia. I used Google to search “Sagrada Familia stained glass design” and found out that Antoni Goudi was the designer. I then made many searches many for books written by Antoni Gaudi. Finally, I searched for central libraries near Mountain View, CA, and searched them for books with Antoni Gaudi as the author. San Jose Public Library was the first library that had a book that stated Antoni Gaudi as the Author. Which suggests this is the definitive work by Mr. Vila Grau. A Google books search/leading to WorldCat shows that the nearest copy to you is in Santa Barbara, CA, about 241 miles away. Oh, my search took about 20 minutes. *Another page with a name "La sagrada familia"
*get a zip code for Mountain View,CA in google --> 94035 (I'll save that one for now). I gotta say I got lucky because when I saw the image, I recognized it from La Sagrada Familia ( I currently live in Barcelona). I googled the designer for their stained glass art and found Joan Vila-Grau (whose name I am sure I will never forget) and then I googled books by him. I found 3, so I decided to find english versions but could not find any. So i re read what you wrote and noticed that you used the word "read" and not "buy", which gave me the idea to search in the public library system for the book that has the most generic name, and I couldn´t find it on the Santa Clara system, but then I searched state wide and they give you the option of inserting a zip code. I entered 94040 (which I must say I got from a post by someone else I took a glipse of) for Mountain View and got here: http://oskicat.berkeley.edu/search/o27359562 It's at the UCB library. I hope you can read Catalan Because I only found this edition. drag and drop the image to google image search. searched similar image.. and found out its from la sagrada familia. found the designer in wiki page of sagrada familia. Joan Vila i Grau. google search "Joan Vila i Grau + books" led to amazon page. the book is Els "vitrallers de la Barcelona modernista". took me 10mins. I knew it was La Sagrada Familia, so I searched for "vitralls" in its website. There's a few available near you, in California, but you might have to learn to read Spanish or Catalan. Took me less than 5 minutes. 1) "Google Search by Image" with the description "stained glass" brought up an image titled La Sagrada Família by Gaudi. 2) Google search for "Sagrada Família stained glass designer" returned an article describing Joan Vila-Grau as the designer of the windows. 3) Joan Vila-Grau's official website lists his publications, and his most general one is "Fita Vitralls", which means "Landmark Windows" according to Google Translate, and you wanted "an important book on stained glass design", and the rest of his books refer simply to specific locations. 4) Searched WorldCat, which I found after a Google search, for the book, didn't find any locations closer to Mountain View than Washington DC's Library of Congress. No results for it at the Mountain View local library's website, understandably. So have a nice flight to DC! 5) If you want to read about stained-glass only in Barcelona, check out his other work, "Els vitrallers de la Barcelona modernista", available at the University of California, Berkeley library, 34 miles from Mountain View. Took me about 5 minutes to find the artist of the window. Reverse image search, found that one photobucket image, searched the watermark for [Sagrada Familia], found the church, searched for [church of La Sagrada Familia glass] and immediately found the artist: Joan Vila-Grau. Spent the next 15 minutes trying to find a book by Joan Vila-Grau, with lots of dead ends. I think the titles being in a different language threw me off! I ended up going with a book called "Church of the Sagrada Familia: The Stained Glass Windows", which, thanks to LibraryThing.com, you can read at Mountain View Public Library, 585 Franklin Street. But after reading other comments, I don't think this is quite the book we're looking for. Although it *is* a book by the artist of those stained glass windows! Side note: while searching, the comments on this blog post kept being returned to me as search results! That's how I knew I was on the (semi) right track! This search took about 15 minutes. I began with an uploaded image search. This search brought me to a site written in Japanese - http://mequesera.exblog.jp/18044614/ Using Google Translate I found reference made to "Goudy"… looking at the other pictures in this blog, I realized that this must really be a reference to "Gaudi" who I happened to know designed the "Sagrada Familia" Basilica in Barcelona. From here it was easy to find reference to the designer of this window, "Joan Vila-Grau". Now, using "worldcat.org" I find over 20 books authored by or co-authored by Vila-Grau. Which book might you be looking for? One of the latest books, written in 2009, is available at the University of Wisconsin, so I suggest you head over to 585 Franklin Street, Mountain View, CA 94041, where the librarian there at this public library will be able to get you whatever you need through inter-library loan. UC Berkeley has a copy of Vila-Grau's 1982 co-authored work entitled "Els vitrallers de la Barcelona modernista". That should also be easily obtainable at your Mountain View location. That reflected the beauty of the molding, ☆ Goudy truly genius." Elsewhere, the blog had also mentioned a trip to Barcelona. Googled "Goudy stained glass" and was asked if I meant "Gaudi." Googled "Gaudi stained glass," found the name Antoni Gaudi. Image search showed similar style windows. Amazon.com author search led me to the book listing "Antoni Gaudí (1852-1926) : Galerie CGER, Bruxelles, 4 octobre-1er décembre 1985." Google Books search for same book showed only 6 results under the "Find in Library" option, the nearest of which appears to be in New York unfortunately! However, I may ask at a local university to see if there could be closer copies or a way to request a transfer. I got the same results as most did but did want to bring up one point. Using Worldcat via Google books does not in fact give you the full results of who holds a particular book. Many libraries (mostly corporate) will not show up in the public version of Worldcat and you will need to ask your local library to help get you the full list. You also need to search Worldcat itself rather than use the Google books find in a library feature as it will often take you to one catalog record when there is in fact several records and one has more holdings than the other. This is due to different libraries cataloging it slightly differently or it may be that there is a reprint of the book. I don't know why this didn't post yesterday. Strange. Anyway, here's my result. First, thanks Dan... I learned a lot doing this exercise. Sagrada Famila '11 was imprinted on the bottom (thanks, random German folk). Now, this is a bit of a cheat, I love history, so I immediately know what and where the Sagrada Familaia is. result -> 1st entry was for www.sagradafamilia.cat/sf-eng/docs_instit/simbologia_b5.php with a descrition of "Vila-Grau"s designs." window was designed? Right? So, I trusted Google's weight metrics, and followed the link to verify. Went to the site directly, but their poor search engine resulted in "No results match your search for 'Los vidrieros de la Barcelona modernista'." Zip codes give a terrible result... and would make a fantastic 20% project (hint, hint, hint). I figured, since you recently posted a stained glass post on G+, I should start there. "Everyone needs a little stained glass on a brilliant Spanish June day.... Also from La Sagrada Familia." search by imgae copy and paste the image url. first 3 entries for the blog only. saw the german one and got the results then to the designer and the book. rest was fairly easy. difficult was to decipher the image result. Did an image search of the work and found a site that led me astray (Lieber Maddin,...), but then noticed more writing in the corner that said La Sagrada Familia. The person who designed this stain glass window was Joan Vila I Grau and the name of the book that he wrote was “Els vitrallers de la Barcelona modernista” and you can find it at UC Berkeley Library. The way I figured this out was by copying the pictures URL and putting it in Google images search bar and there I found one picture with the phrase Sagrada Familia, which was actually the name of the church in which this stained glass window was located. I typed in “Sagrada Familia stained glass window designer” and one website came up with all the information about it. The name of Joan Vila I Grau came out as well.. Then I typed in amazon.com Joan Vila I Grau stained glass design book and then Els vitrallers de la Barcelona modernista came out. Then I went to worldcat.org and searched the name of the book and input the destination Mountain View, A and Viola! UC Berkeley Library came out. It took me about 30-35 minutes to solve the challenge. 3. Searched “stained glass” within that website and clicked on second link which identified Joan Vila-Grau book as the designer. 4. Google search “Joan Vila-Grau book”- first link was Amazon.com for “Els vitrallers de la Barcelona modernista” by Joan Vila-Grau. 6. Searched WorldCat for title with Mountain view CA as location and found book at UC Berkley. found similar image, hovered, found name! "stained glass" book "antoni gaudi"
Tried finding in Amazon search due to frustration, couldn't find it, remembered Google Advanced Search. Time: 7:16, total is 56 minutes. time: 7:19, total of 59 minutes overall. Ok, after glancing over the comments thus far, I have learned we can drag and drop and do a search by image. I'm blown away, I did not know that! I spent a good 10 minutes or so using the Filter Color to Blue and searching ["stained glass" church] and a few other variants on that to get that to work. So, at the least this exercise has taught me that. After learning the inauthor: operator, I also spent a ton of time trying to figure out which book exactly Gaudi wrote, which I thought was a bit nutty as he died in 1926, so I was filtering for 20th and 19th century results. I'm still not sure of the answer as it seems he wrote a few books (or contributed), and am looking forward to seeing the results. 10. So do a normal search instead. 20. Going back one screen, there is another link on the left hand side for Find A Library - clicking on that and entering Mountain View CA as the location takes me to a list of libraries holding it and the nearest is The Library of Congress in Washington 2400 miles away! It took me over an hour! This question also took me some time to research. I started by clicking on the picture to copy the image which I dragged into the search box of Google Images (trick learned in your online class). Clicked on the blog.strongrl.com link to see what would pull up and found out about Sagrada Familia and Gaudi. Perhaps carelessly, I started searching for a book by Gaudi but found nothing useful. I searched in both Google Scholar and Books; I was getting useless hits which is when I realized my assumption was likely incorrect. I ran a simple search for [sagrada familia designer stained glass] found the link to the Basilica which is where I found the name of the maker/designer Joan Vila Grau. I was curious so I just searched for him, found a wiki page and his website which incidentally listed books he wrote. To be safe, I ran a search on both Google Books and Scholar. My major difficulty was, and still is, figuring out which of his books could be defined important relative to stain glass design. I found 2, possibly 3, books he wrote that could be considered relevant: 1) Las Vidrieras Mondernistas Catalanas; 2) Church of the Sagrada Família: the Stained Glass Windows; 3) Els vitrallers de la barcelona modernista. I thought that #2 could be the least relevant as the question pointed to an important book on design rather than the specific artwork in the picture/church. To find out what could be considered authoritative, I did a search on Google on stained glass design (I forgot the actual search terms, nothing complex, likely something as follows [stained glass design grau]) and pulled up an uk site, http://www.bsmgp.org.uk/Resources/Bibliography.htm, listing relevant books on the topic. Entered a Command F to find Grau which showed #1: Las Vidrieras Mondernistas Catalanas. In the same Google search, I also found an article/interview with Grau which mentioned book #1 and 2. I also searched http://www.cmog.org/research/library-search?query=stained%20glass%20design%20grau&sm_vid_Object_Type=Books which was referenced in the uk site. There, where I did not spend too much time, I did not see anything that was pointing to which book by Grau could be considered important for the purposes of this search. It seemed reasonable that of the list above, 1 and 3 were more likely those that were authoritative with number 3 being a good guess since it is listed first in the author’s site. It would stand to reason that that the author would list first his most important book. Went to worldcat.org and searched by author rather than title to see what would pull up. I reasoned that doing so would pull translations as well since not all the 3 titles appeared to be translated in English (I had checked that in Google Books by narrowing my search by author, languages, and selecting book only). For all three found the closest location. Number 1 was found in California but too far for a drive (245 miles away if the zip code given in the site for Palo Alto was correct, to be accurate one should double-check). Number 3 can be found locally at two local universities. The number and type of hits in Worldcat indicated to me this latter was likely the most authoritative of the two books. At this point, I was pretty sure I wanted to drop #2 from the list which I did after looking at the availability. If I had more time, I would go on google maps, pull local libraries to check their lists and see what pulls up there. Just to be sure, I put both titles in Google. The number of hits on #3 Els vitrallers de la barcelona modernista led me to believe that is the correct title. PS: pardon how this answer was written, not time to polish things up.